Happy New Year! 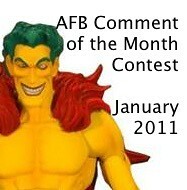 The AFB Comment of the Month Contest for January 2011! Wow, 2010 went by fast! I hope your holidays have been great and you have lots to look forward to in 2011! As for our contest, thanks to everyone who commented on last month’s blog posts! Congratulations to AFB Forum Member Polarboy for being our randomly selected winner and final comment contest winner for 2010! Once we hear from Polarboy, his choice of either the DC Universe Green Lantern Classics Series 1 Kyle Rayner figure or DC World's Greatest Superheroes Retro Series 3 Flash will be on the way when available from Mike’s Comics N’ Stuff. 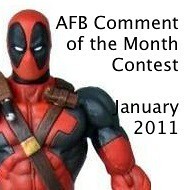 Now to January’s Contest: on offer are two great prizes, either the DC Universe Classics Wave 16 Creeper figure from Mattel or the Marvel Select Deadpool figure from DST. Winning either would be a great start to the new year! Yay Winner! Yat AFB! 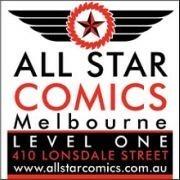 Yay Mike's Comics! Good stuff PB! Well done. Thanks everybody and thanks to the guy who run all this. Oh man, this blog is sooooo awesome. Keep up the good work! These contests are super sweet. oh man, you lucky dog. I am super jealous this month but... congrats!